Blonde Redhead at the Commodore, Nov 21 2010. Tamara Lee photo. It would have been easy (and warm) enough to stay home last Sunday night to catch up on a week’s worth of trashy TLC series. But I’m glad I skipped my weekly routine to catch the Blonde Redhead show at the Commodore Ballroom instead. The New York-based trio is an amalgamation of diverse styles, instrumentation and moods; the three members incorporate the best of all worlds, as their paradoxical name suggests. From the metallic umbrella backdrop, to the random use of castanets, to lead singer and bassist Kazu Makino‘s possessed dance moves, the show was innovative and idiosyncratic, to say the least. In the past, the band has shrugged off the reputation of being “artsy”. Whether or not it’s a label it subscribes to, that is exactly the sort of fans the group attracts. The smoky venue was swarming with hipster/beatnik-types, with unconventional habits, like playing a game of gin-rummy in a crowded concert venue. But all games came to a halt once Blonde Redhead made its Kubrick-esque entrance. The flickering, golden lightbulbs on the stage illuminated the porcelain tribal mask that Makino wore, adding to the ghostly aura of the opener “Black Guitar”. The uncanny resemblance of identical twins Amedeo Pace and Simone Pace (the remaining two-thirds of the band) also made for an eerie and amusing sight. The eclectic group placed their best foot forward with “Here Sometimes” and “Oslo”, dub-flavoured tunes that worked seamlessly with Makino’s feathery and sultry voice. Both can be heard on their current LP, Penny Sparkle, a record that delivers dream-pop at its best. Switching the tempo to the bright and fast-paced “Dr. Strangelove” and “Spring and by Summer Fall” allowed Amedeo Pace to shine on vocals and guitar. Both numbers stayed close to 80s punk and new wave melodies and rhythms, but with a more sinister slant. The musically restless theme of the night continued with “Equally Damaged”, grabbing the audience with playful guitar trills, analog riffs and controlled drumming from Simone Pace. Blonde Redhead capped off the evening with the darker, and highly anticipated numbers, “Falling Man” and “23”, evoking a far grittier Ultravox. In total, the band murmured about a total of eight words a couple of thank you’s each from Makino and Amedeo) between songs. I personally did not mind the lack of conversation. They did not have to explain the intricacies of their carefully crafted music; it was apparent from the get-go. Complicated without being pretentious, I am incredibly curious to see what bounds Blonde Redhead pushes in the future. 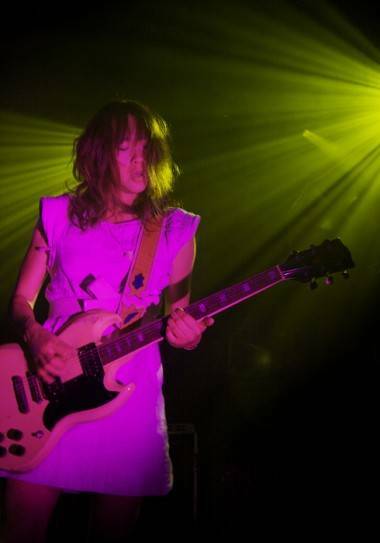 This entry was posted in concert reviews and tagged Blonde Redhead, Commodore Ballroom, indie-rock, Vancouver concerts. Bookmark the permalink.